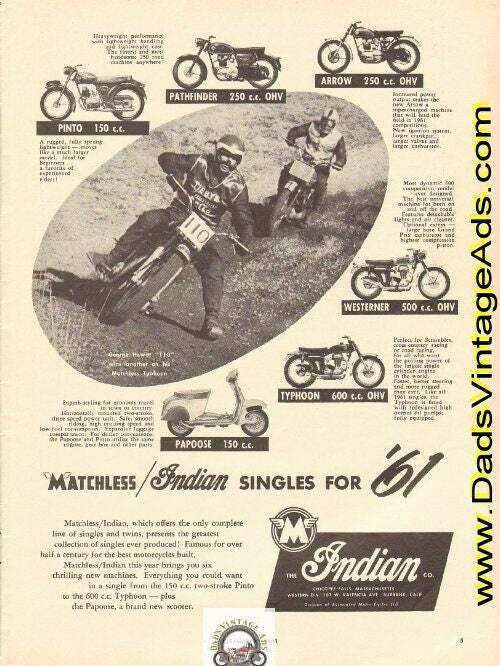 Matchless / Indian, which offers the only complete line of singles and twins, presents the greatest collection of singles ever produced! Shown: Pinto 150 c.c., Pathfinder 250 c.c. OHV, Arrow 250 c.c OHV, Westerner 500 c.c. OHV, Typhoon 600 c.c. OHV, Papoose 150 c.c. ; Shown in photo: George Hewitt "110" wins another on his Matchless Typhoon.